Adjustable widths to perfectly fit your vision. 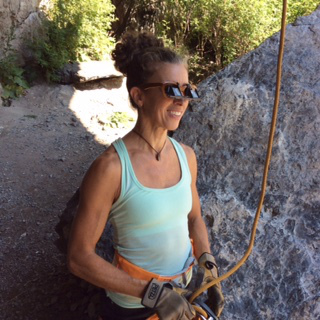 My pair of Belay Optics belay glasses have been awesome. I typically climb 2-3 days a week in the gym and have been wearing a different pair of belay glasses pushed on top of my prescription glasses. My old belay glasses were double the price of the Belay Optics and don’t work nearly as well with prescription glasses. I held off getting belay glasses because I felt self-conscious wearing them. I’m petite, and whenever I wore a pair, I felt like a weirdo. The streamlined look of Belay Optics’ glasses intrigued me enough to give them a try. And now I never belay without them. They are super comfy, and I’ve adjusted them to fit perfectly. Perfect for climbers with prescription glasses or avid outdoor climbers who hate the glaring sun in their face. Avoid eye strain, headaches & nausea. Avoid chips and scratches: You won't have to replace your belay glasses as frequently. Get optimal vision clarity by fine tuning your adjustable prisms. No more hassle of getting traditional belay glasses to work with prescription glasses. In a nutshell: Our patented adjustable clip-on belay glasses let you safely belay in comfort with optimal field of vision. Only 50 available due to limited quantity.